ARLINGTON, Texas (AP) — Texas Tech and Baylor have reached the regular-season finale in the same position, needing a win to get bowl eligible. Still, the modes of the two teams couldn’t be much more different going into Saturday’s game in the NFL stadium where the Big 12 championship game will be played a week later. For Rhule and the Bears (5-6, 3-5 Big 12), getting to a bowl game a year after winning only once would be quite a boost. Unfortunately for Kliff Kingsbury and the Red Raiders (5-6, 3-5), this is an all-too familiar position that has their former quarterback on the coaching hot seat again. A win in their regular-season finale at Texas last season likely saved Kingsbury’s job. 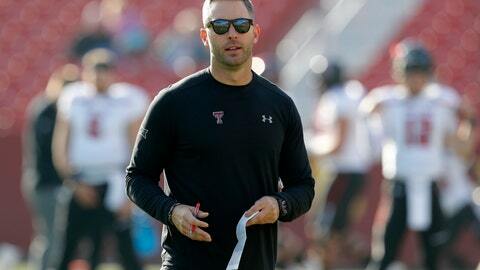 It is unclear what impact, if any, the outcome of this game might have on Kingsbury’s future. Baylor has lost two in a row with a chance to get its sixth win. The Bears lost 16-9 to TCU last week in the home finale for 10 fifth-year seniors who stayed after a sexual assault scandal on campus that led to them playing for three coaches and going through a 1-11 season last year. When the Red Raiders started Kingsbury’s sixth season 5-2, his coaching record was 35-35. They have since lost four in a row, with consecutive home losses to No. 6 Oklahoma and No. 11 Texas by a combined 12 points before only 181 total yards without a touchdown in a 21-6 loss at Kansas State . The Red Raiders know they may be playing for more than a bowl game. This could be for the coaches. Texas Tech true freshman quarterback Alan Bowman, the nation’s leading passer early in the season, has been sidelined for the second time because of a partially deflated lung, and dual-threat Jett Duffey is dealing with a knee and other issues. Carter McLane is also an option to get his first start since the opener, when he suffered an ankle injury in the first half. The 6-foot-5 Wesley leads the Big 12 with 84 catches for 1,375 yards. The 6-6 Vasher has 48 catches for 626 yards. This will be the ninth season in a row the game is played in the Dallas area, the eighth at AT&T Stadium. The series returns to campus next year for the first time since 2008. Baylor is 5-2 against Tech in the home of the Dallas Cowboys. Tech won a 2010 game at Cotton Bowl Stadium. The Bears have blocked seven kicks, most in the country this season, and the most by Baylor since nine in 1989. BJ Thompson blocked a punt and an extra point last week against TCU. He also had a blocked PAT earlier this season. Texas Tech has a 38-37-1 series lead. … Red Raiders kicker Clayton Hatfield’s 49 career field goals are one short of matching Ryan Bustin’s program record. Hatfield’s 12 consecutive made field goals are a school record.